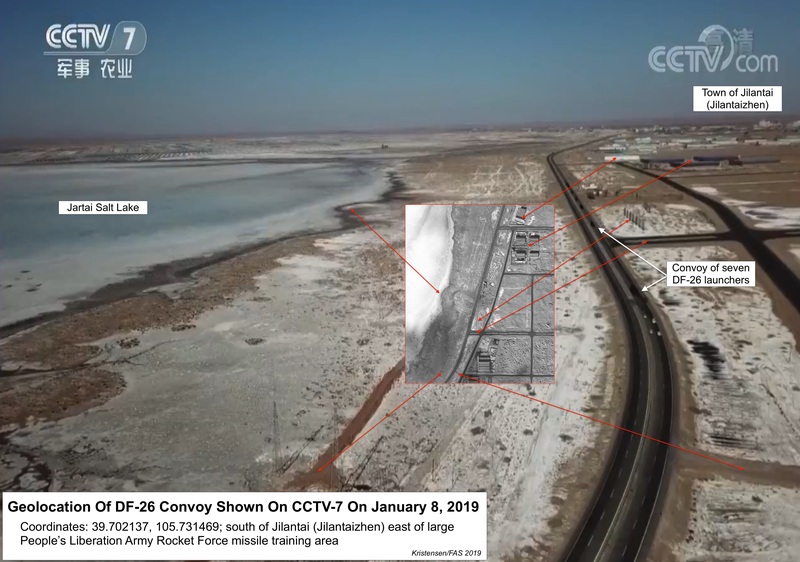 [Updated Jan 31, 2019] Earlier this month, the Chinese government outlet Global Times published a report that a People’s Liberation Army Rocket Force (PLARF) unit with the new DF-26 intermediate-range ballistic missile had carried out an exercise in the “Northwest China’s plateau and desert areas.” The article made vague references to a program previously aired on China’s CCTV-7 that showed a column of DF-26 launchers and support vehicles driving on highways, desert roads, and through mountain streams. As it turns out, the exercise may have been west of Beijing, but the actual location is in upper Central China. Several researchers (for example Sean O’Connor) have been attempting to learn more about the unit. By combining scenes from the CCTV-7 program with various satellite imagery sources, I was able to geolocate the DF-26s to the S218 highway (39.702137º, 105.731469º) outside the city of Jilantai (Jilantaizhen) roughly 100 km north of Alxa in the Inner Mogolia province in the northern part of central China (see image below). The DF-26s appear to have been visiting a new missile training area established by PLARF since 2015. By combining use of Google Earth, Planet, and Terra Server, each of which has unique capabilities needed to scan vast areas and identifying individual facilities, as well as analyzing images purchased from Digital Globe, I have so far been able to identify more than 100 launch pads used by launchers and support vehicles during exercises, a support base, a landing strip, and at least eight launch unit camp sites covering an area of more than 1,000 square kilometers (400 square miles) along a 90-kilometer (55-mile) corridor (see image below). A Google Earth placemark file (kml) with all these locations is available for download here. 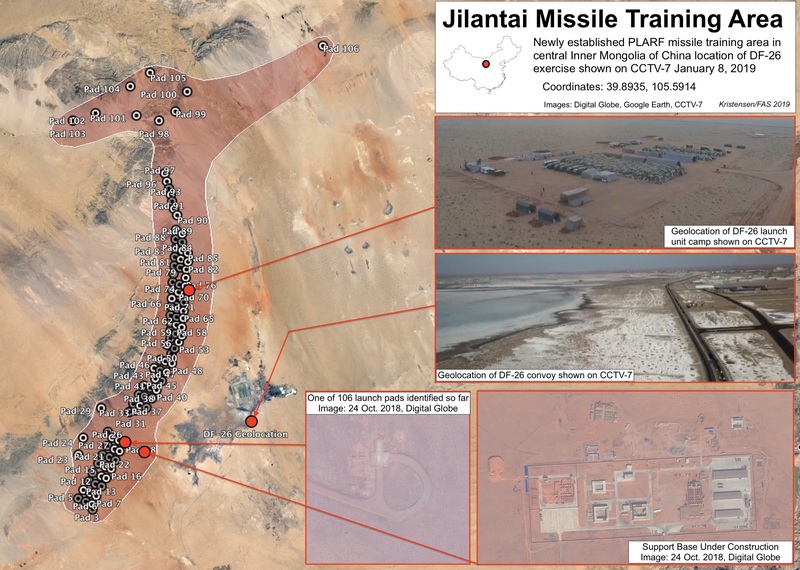 The Chinese military has for decades been operating a vast missile training area further west in the Qinghai province, which I profiled in an article a decade ago. They also appear to operate a training area further west near Korla (Beyingol). The best unclassified guide for following Chinese missile units is, of course, the indispensable PLA Rocket Force Leadership and Unit Reference produced by Mark Stokes at the Project 2049 Institute. It is not clear if the DF-26 unit that exercised in the Jilantai training area is or will be permanently based in the region. 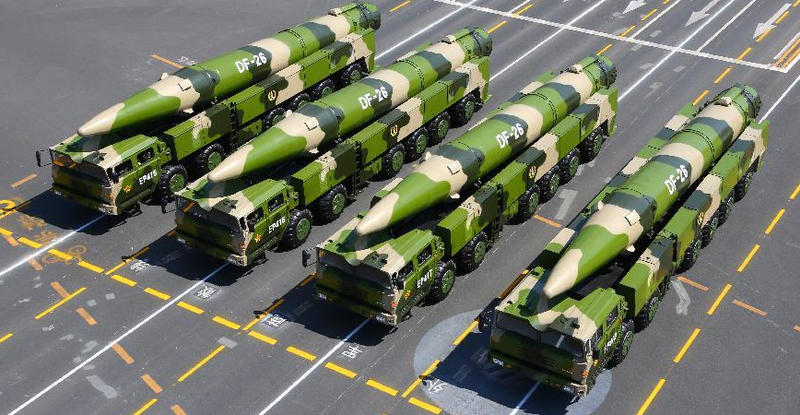 It is normal for Chinese missile units to deploy long distances from their home base for training. The first brigade (666 Brigade) is thought to be based some 1,100 kilometers (700 miles) to the southeast near Xinyang in southern Henan province. This was not the first training deployment of the brigade. The NASIC reported in 2017 that China had 16+ DF-26 launchers and it is building more. 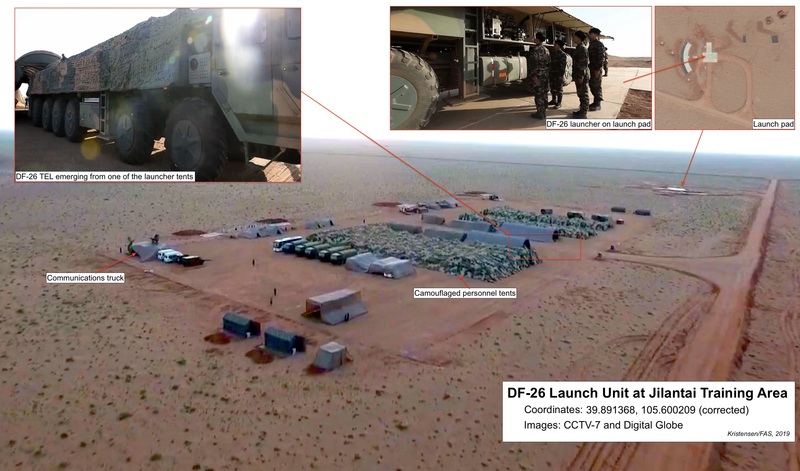 The CCTV-7 video shows an aerial view of a launch unit camp with TEL tents, support vehicles, and personnel tents. A DF-26 is shown pulling out from under a camouflage tent and setting up on a T-shaped concrete launch pad (see image below). More than 100 of those pads have been identified in the area. The support base at the training area does not have the outline of a permanent missile brigade base. 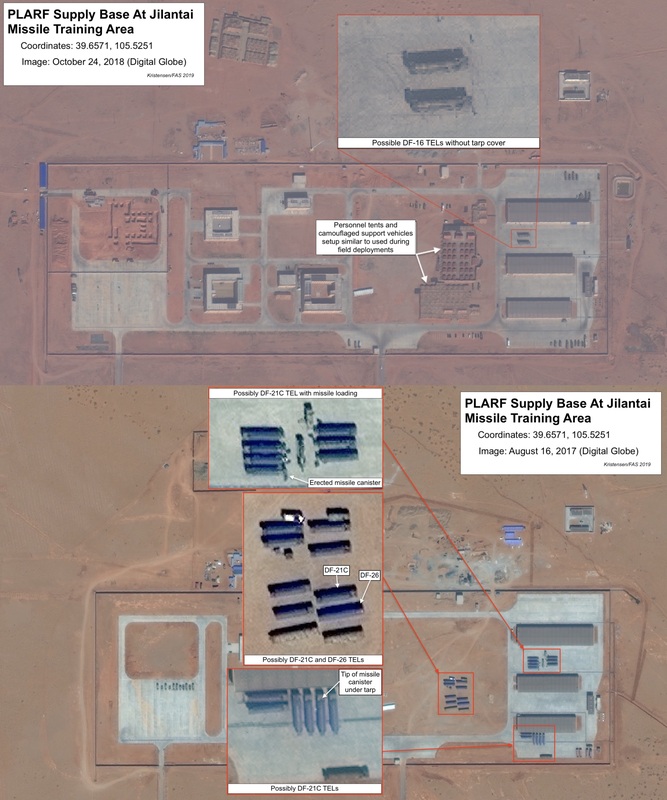 But several satellite images appear to show the presence of DF-16, DF-21, and DF-26 launchers at this facility. One image purchased from Digital Globe and taken by one of their satellites on October 24, 2018, shows the base under construction with what appears to be two DF-16 launchers (h/t @reutersanders) parked between two garages. Another photo taken on August 16, 2017, shows what appears to be 22 DF-21C launchers with a couple of possible DF-26 launchers as well (see below). The DF-26, which was first officially displayed in 2015, fielded in 2016, and declared in service by April 2018, is an intermediate-range ballistic missile launched from a six-axle road-mobile launchers that can deliver either a conventional or nuclear warhead to a maximum distance of 4,000 kilometers (2,485 miles). 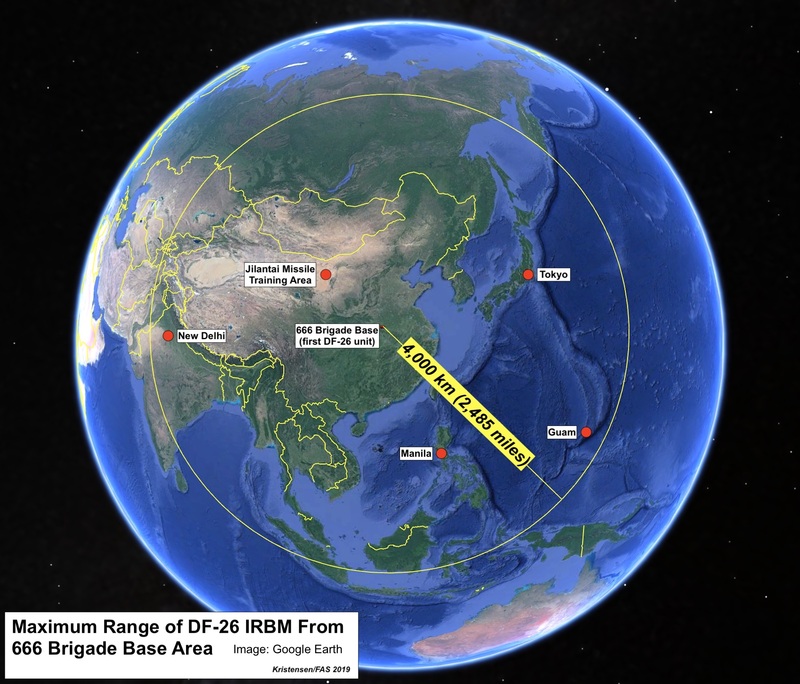 From the 666 Brigade area near Xinyang, a DF-26 IRBM could reach Guam and New Delhi (see map below). China has had the capability to strike Guam with the nuclear DF-4 ICBM since 1980, but the DF-4 is a moveable, liquid-fuel missiles that takes a long time to set up, while the DF-26 is a road-mobile, solid-fuel, dual-capable missile that can launch quicker and with greater accuracy. Moreover, DF-26 adds conventional strike to the IRBM range for the first time. The 666 Brigade is in range of U.S. sea- and air-launched cruise missiles as well as ballistic missiles. But the DF-26 is part of China’s growing inventory of INF-range missiles (most of which, by far, are non-nuclear), a development that is causing some in the U.S. defense community to recommend the United States should withdraw from the INF treaty and deploy quick-launch intermediate-range ballistic missiles in the Western Pacific. Others (including this author) disagree, saying current and planned U.S. capabilities are sufficient to meet national security objectives and that engaging China in an INF-race would make things worse. This publication was made possible by a grant from the Carnegie Corporation of New York, the John D. and Catherine T. MacArthur Foundation, the New Land Foundation, and the Ploughshares Fund. The statements made and views expressed are solely the responsibility of the author.